Yesterday (Sunday) Bill and I returned from our self-proclaimed “baseball and crop tour.” The baseball part was all in eastern Iowa; the crop part extended into Illinois. 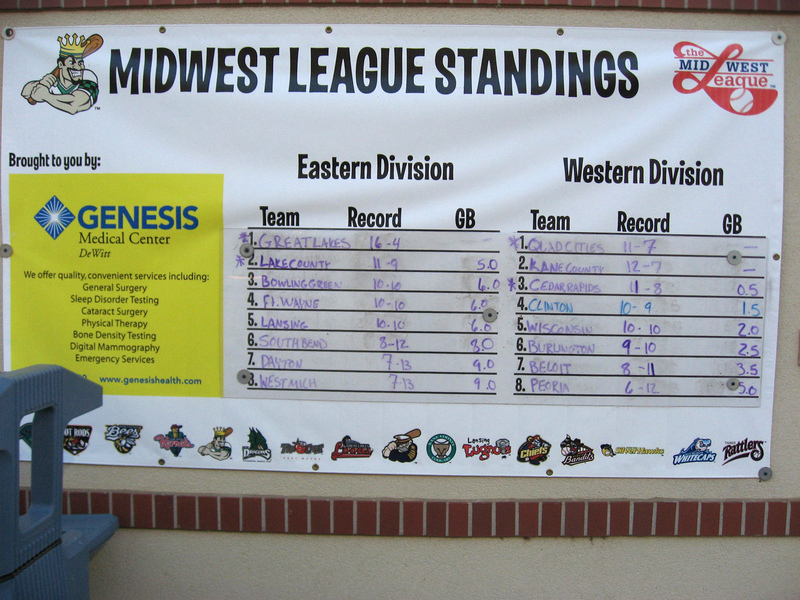 Each evening of this past Wednesday through Saturday, July 14th-17th, we attended a Class A minor league baseball game. The first three were along the Mississippi River; the fourth was in Cedar Rapids. We weren’t all that wild about the beer at any of the brewpubs where we stopped, but we did like the Bier Stube Bar & Grill in LeClaire. The pretzels and beer were authentic enough to stir fond memories of Germany. Our favorite ballpark ambience was at the Burlington Bees’ Community Field; its atmosphere came the closest to being pure baseball. Although there was a brick and mortar stadium, a sense of Field of Dreams entered our minds. We sat in the third row on the third base side. While players were on deck we could listen to them talk with each other and/or talk with spectators. We liked that the atmosphere wasn’t as commercialized as at the other three ball parks. The only drawback was that we weren’t in the shade; we were at the other ballparks. However, even though temperatures had been into the mid- (maybe upper?) 90s the evening we were at the Bees’ ballpark, with the sun at our backs and the game starting at 7:00 PM, we were comfortable. I would be remiss if I didn’t mention the Burlington Bees’ regular attendee, Dancing Bob. Bill and I got a kick out of watching Dancing Bob dance to just about every song played over the Bees’ PA system. According to the woman sitting in front of me, Dancing Bob attends every (or almost every?) game and, with his brother, after the games cleans up the stadium. The night we were there, throughout the game Dancing Bob was surrounded by children who danced the night away with him. 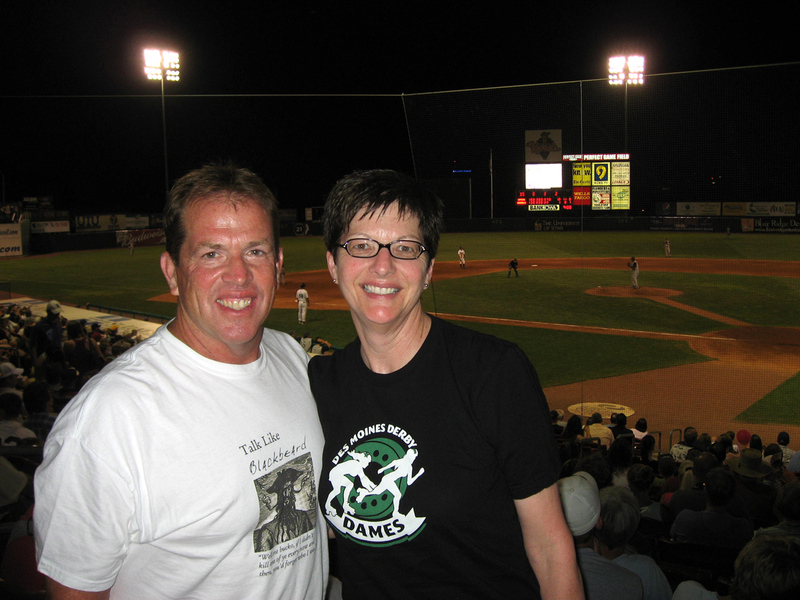 Our “worst” ballpark food was our brats at the Quad Cities game. However, in hindsight that might have been because their brats are probably more like authentic German brats (definite casing to chew through, which I’m not fond of), indicative of the German heritage in that area. Admittedly, the following photos of Bill and me aren’t all that exciting or telling. 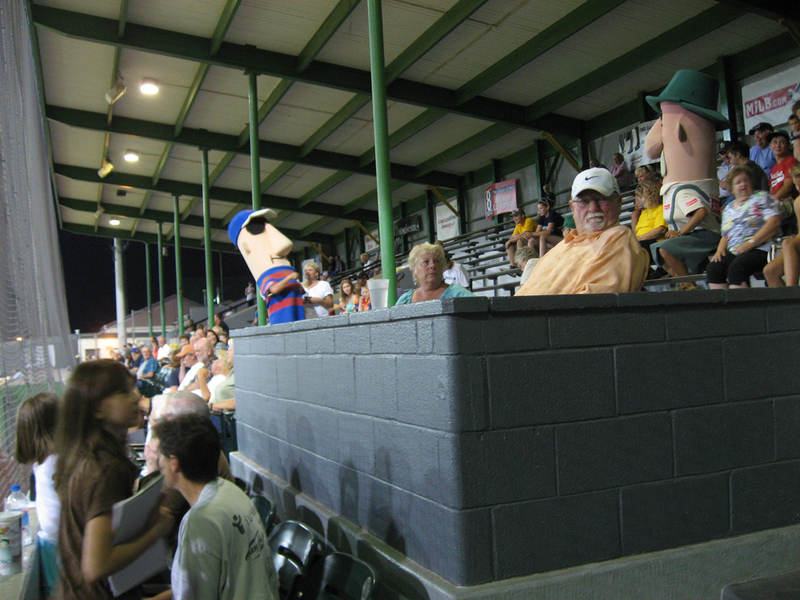 Basically we have about one photo from each ballpark, except for at the Clinton stadium where the Klement’s Sausage mascots were just too funny. The following links provide team/stadium information. 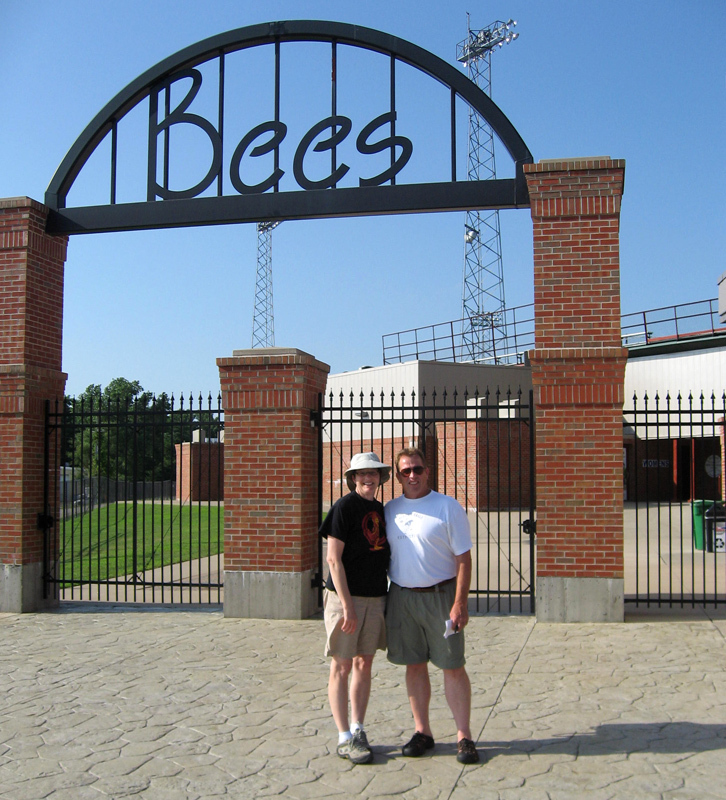 Bill and me before the Burlington Bees game, July 14th. 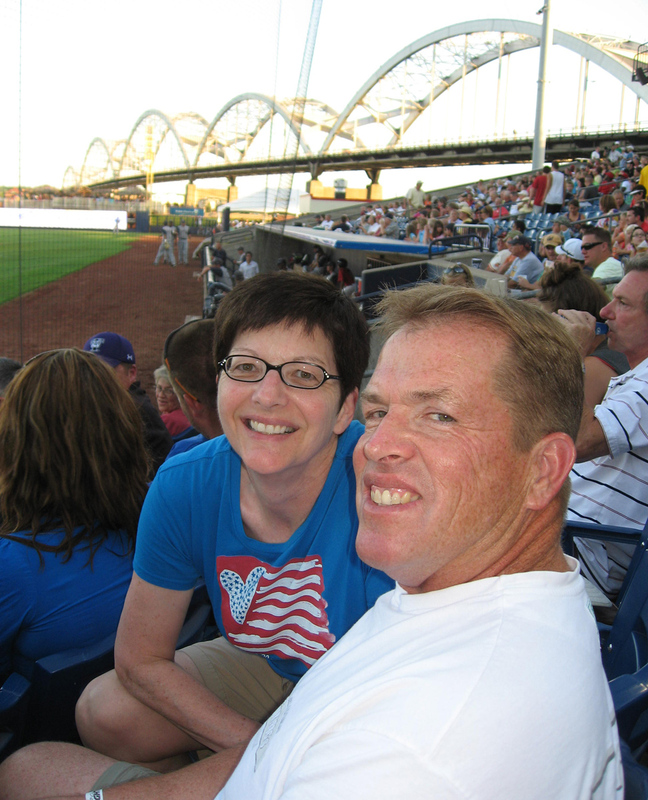 During the Quad Cities River Bandits game. In the background is the bridge over the Mississippi River. 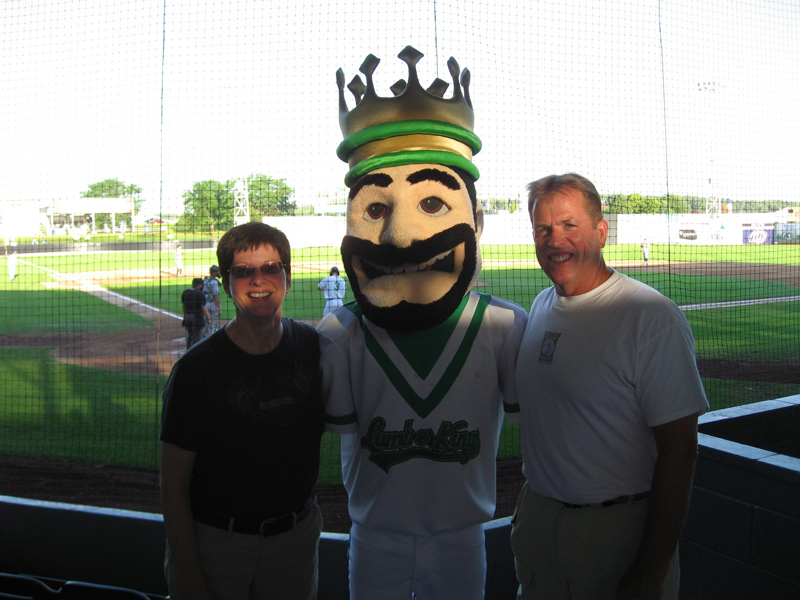 At the Clinton LumberKings game. In the 9th inning of the Cedar Rapids Kernels game. This entry was posted on July 19, 2010 at 12:32 pm and is filed under Travel, Uncategorized. You can follow any responses to this entry through the RSS 2.0 feed. You can skip to the end and leave a response. Pinging is currently not allowed. Mick is from Burlington. I’ll let him know you visited his old stomping grounds. Actualy, the Fun!!!!!!!! was supposed to be here.